I have written before that my wife and I are beer tourists. We’ll take off on a weekend day and visit breweries, new ones and familiar ones, in Madison and elsewhere. Recently we’ve visited two that made a big impression on us. The first one is in Madison: Working Draft Beer Company, which opened in March at 1129 E. Wilson Street, across from McPike Park (formerly Central Park). It’s not just a brewery; it’s intended as a venue for artists, whether it’s providing gallery space or a venue for musical performances and poetry readings. It’s also a neighborhood gathering place. On a recent Sunday, the place was full of people of all ages, including several families. Working Draft has several long tables, so you can’t help but socialize with your fellow patrons. The sort of social vibe we found on that day is one of the things Ann and I love the most about craft-beer culture. The second one is in Darlington, in Lafayette County. City Service Brewing is located in an old gas station right downtown on Main Street, and the building still looks very much as it did when it was built in 1931. City Service is celebrating its first birthday this month. 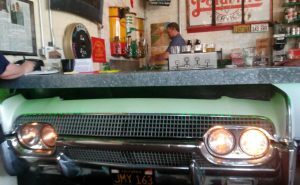 The picture accompanying this post gives you a look at one end of the bar, which is built on top of a 1962 Lincoln Continental. The taproom is full of automotive memorabilia and a motorcycle that spent 56 years at the bottom of a lake hangs from the ceiling. (Really. If you want to know the rest of the story, you’ll have to visit and find out for yourself.) Ann tells me the ladies’ room is quite unusual, although I have to take her word for it. Working Draft, City Service, and places like them are fun if you like to people-watch. They’re local businesses, so their success is good for the community. In the case of City Service, they preserve old or historic buildings. If you don’t consider yourself a beer drinker, or your beer of choice is fizzy, yellow, and nationally advertised, tell the bartender that. Chances are they can recommend something you’ll like that’s made only a few feet from where you’re sitting.